Looking through philatelic press in an effort to keep up with all the news published about the revenues stamps, sometimes I find articles containing paragraphs that may create confusion among readers and future collectors. I refer to the article "speculative errors" published in Brasovian Philatelic Studies No.4 (25) / 2012, article in which the author considers the introduction of the "Timbru de ajutor" (help stamp) in the Romanian revenues catalogue, as erroneous. It is not clear if the author is making this statement about the overprint or the stamp. So it requires attention and a clear justification when making statements regarding the Romanian stamps and their status, so as not to create confusion. Without claiming to be a study of "Timbru de ajutor" (help stamp), the purpose of this article is just to clarify and bring together the general and particular information concerning the issuance, use and place, complementing with excerpts from the laws. A part of the information has been collected and presented again in a single article. "Timbru de ajutor" (help stamp) was born of a fiscal (tax) necessity and is really the first revenue stamp designed for fundraising at national level by an Act of the Ministry of Finance, both from the use of the postal service and from tax service by completing, the existing taxes. There have been several earlier attempts to collect these funds at national level based on regulations and circulars. But because these fees were voluntary, not all the population contributed. 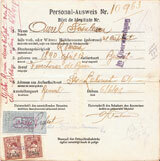 I refer to stamps of 5 bani red and 5 bani green 1913 issued to the Society for Prevention and assistance tuberculosis. They were introduced in the postal service by the General Directorate of Posts and Telegraphs to the Order no. 1980 from January 15, 1913, as no postal value vignettes provided with figures and accepted by all countries in the UPU postal mail, the stamping is not required under Circular no. 72 408 from October 5, 1914. .
Special law authorizing the taking exceptional actions Promulgated with the Royal Decree No. 3890 from December 23, 1914 and published in the "Official Monitor" No. 217 of December 24, 1914 and its amendments promulgated with the Royal Decree No. 1428 from April 5, 1916 and published in the "Official Monitor" No. 5 bis of April 5, 1916.
d)	The revenues obtained of the special stamp Lei 50, 10, 9, 8, 7, 6, 5, 4, 3, 2, 1, 0,50, 0,20 , 0,10 and 0,05 Bani, called "Help stamp", which will obligatorily apply in addition to the existing stamps as follows: revenue help stamp of 0,05 Bani on postcards and letters that are sent to the country from one place to another, even recommended; of 0,10 Bani on domestic telegrams and 0.20 Bani on foreign telegrams. 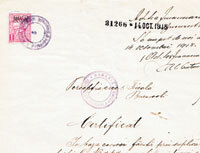 Revenue stamp on the telegrams will be replaced by levying an equal. The same special revenue of 0,10 Bani will apply in addition to existing tax stamps on the receipts by shipping luggage rail on the carriages, on the bank slips and to any act, receipt or invoice, on which day, according to the law stamps applies to mobile stamp of 30 Bani or 10 Bani. On the bank checks bordereaux will apply a help stamp of 20 bani. But for those related to sales and purchases of effects will be applied over the stamp of 20 bani a help stamp of 50 bani for every thousand Lei. Stamp of 0,10 bani will apply in addition to the existing revenue stamps, on any bills at hotels, restaurants, pubs of every description, cafes, bakeries, breweries, dairies and other places for consumption, the amount of the payment goes by 1 Leu and not achieve 2 Lei, by at 2 to 10 Lei a stamp will be applied of the 0,20 bani, the Lei 10 and up will be 0,50 bani. Owners and Entrepreneurs of such establishments are required to give, and customers to request note bearing the stamps above whenever you meals passing a 1 Leu. The Council by Ministers will be able to replace a stamp applied under this paragraph with stamped booklets with pages that payment will passes consumptions. If the price is Lei 100-200 including, stamp will be 1 Lei, if the price is Lei 201-1000 including, 1 Leu per hundred, if the price is up Lei 1001 stamp will be of 50 lei. Special stamp called Help stamp will be replaced by stamping (overprinting) and overcharge in the proportion shown in this article, of the postage stamps and revenue stamps in the circulation today, overprinting operation will be made by the General Administration of Posts and Telegraphs and by the State Monopoly Administration. Special stamp of 10 Bani for every Leu or fraction will be applied over existing theatrical stamps on any ticket to theaters, cinemas, concerts, conferences and any kind of representation or the show with costs of entry. 0.50 bani special stamp will apply in addition to the existing revenue stamp on each carriages beds ticket payment of the international carriages Company with beds, circulating in the country and travel certificates free permits based on the same carriages, and on the consumption from the dining car noteswill be applied a stamp of 0.20 bani on the receipts for food, and 0.10 bani those by other consumers. Employers respond along with their servants and suffer the same punishment for having not applied the help stamp, receipt books, as well as any other breaches that would aim to circumvent the application of the dispositions of this article. The General Directorate of Posts and Telegraphs shall issue and will put into circulation help stamps, which will be sold as other stamps, postage, with the same privileges and sanctions. Amount resulting from their sales will submit at the end of each month at House of the Central Committee. The attempts to circumvent the law shall be notified through statement, partial or total of the help stamps in all cases mentioned above, by any fiscal agent, administrative, or policy, and by the special delegates of the Central Committee, and those who belong to the county committees and communal. The trespassers will be punished with a fine of 10 to 100 Lei and in case of recurrence from 100-1000 Lei, which will give for the benefit central committee, county or communal, after place where the offense occurred. Sentencing will be announced by the respective county Law Court, without appeal or recourse. e)	The income produced by the increase of 0.20 Bani of any 1st class rail ticket, and 0.10 Bani for 2nd class, regardless of the distance, and a fee of 10 lei, which will take the issue or extension to any subscription ticket with full pay or reduced railroads 1st class, whatever the distance and duration. For subscriptions of 2nd class, fee will be only Lei 5. The same fees will be charged, also for free of charge standing tickets. The General Directorate of Romanian railways will keep a special account for the product of these charges, which at the end of each month, will pay up to the house of the Central Committee. f)	The income produced by increasing the cost of Lei 4, with the State Monopoly Administration, sell the pair of luxury cards and Lei 2 for the pair of ordinary playing cards. This provision will apply only to the playing cards which it will bring into service after the promulgation of this law. The State Monopoly Administration will pay at the end of each month, this income to House of Central Committee. For games in which chance has the main role, which is played in casinos, clubs, societies and in all public places will be subject to increase help fund a 20% tax over the gross gaming product. On the net gain to the state lottery or any lottery authorized, will be charged a 5% fee for the benefit of "Family of the Fighters". This tax will be deducted and paid to the "Family of the Fighters" by the state lottery administration and authorized lottery organizer. Determining conditions as the way of control, finding and collecting these fees will be in a regulation to be drawn up by the Ministry of Interior to the "Family of the Fighters". The Central Committee may give a destination to half of the proceeds referred to in point d, e and f in order to subsidize, as needed, the two Red Cross societies, who take care of the Wounded and sick of war. The revenue in point. d, e and f shall enter into force on the promulgation of the present the law and remain in fact abolished from the date of the decree, the passage of the army in peacetime. -	Stamp of 10 bani: on the parcel post expedition bulletin (waybill), for the arrival or delivery of parcels and telegrams, all internal. Help stamps were not mandatory on other types of correspondence such as printed matter, business papers, samples of goods, newspapers, money orders and correspondence "locally". 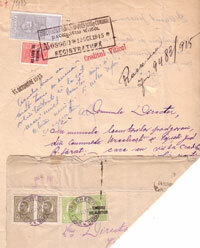 All of these correspondences could however use the stamps voluntarily. Help stamps - Franco, produced from the postage stamps Franco for 1 leu (Carol I, engraved) and a revenue stamp of 5 lei (Carol I, general issue of 1911), overprinted with the words "TIMBRU DE AJUTOR" (HELP STAMP) were put into circulation by Circular no. 23852 of April 19, 1916 . The help stamps issued in the year 1916 with face values of 5, 10, 50 bani, 1 leu, 2 lei and 5 lei and those help stamps - tax due face values of 5 and 10 bani were withdrawn from circulation on 2/15 iulie 1918 according to the announcement no. 20.895 of July 5, 1918 . ...It will give orders to the military administration of Romania, the reintroduction of stamp duty under the laws of 02.24.1906 and 24.12.1914. Regulation is again available, simply that failing punishable stamps required (prescribed), falsification or reuse, as well as unauthorized trade with them. A renewal is vitally important is that and "Timbru de ajutor" (help stamp), who were sold been possible so far through post offices will be purchased in future from the fiscal agents, flow, etc. Since the income from stamp duty both used for the same purpose, therefore be considered primarily to pay salaries, pensions, benefits and other expenses of the state, not an inevitable settlement separately as possibly been possible so far. Therefore it was decided that instead of help stamps be possible using normal postage stamps, and vice versa. a) Postage stamps franco for 15 Bani brown, 25 Bani dark blue, 40 Bani sepia, 50 Bani red,1 Leu dark green, 2 Lei dark yellow. b) Postage stamps - tax due of: 5, 10, 20, 30 and 50 Bani, green paper printing Black. c) Help stamps franco of 10 Bani black, 50 Bani dark brown, 1 Leu blue, 2 Lei dark red. d) Help stamps tax due of: 5 Bani light red, 10 Bani dark brown". Fig-1 Request to a public authority 12/10/1915, the stamp tax of registration perceived 2nd class with 30 bani revenue stamp under Article 17§1 of the Law of stamp duty and registration 1914 for all Petition addressed to any public authority, and help stamp of 10 bani under Article 23§d of the Special law 1915.... of any act, receipt or invoice, on which day, according to the tax stamp law apply to mobile stamp of 30 bani... The document is sent by mail, postage being perceived of 10 bani for other places + 25 bani registered mail fee according to Postal Regulation January 1, 1914, and the stamp duty of help stamp of 5 bani under Art. 23§d of the Special Law 1915 .... postcards and letters that are sent to the country from one place to another, or even recommended. 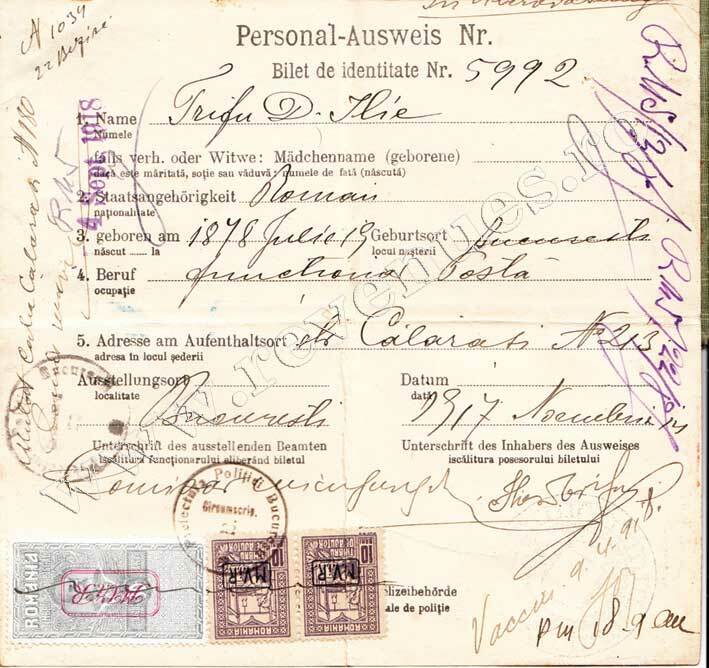 Fig-4 Identity card, valid for one year multiple entry, issued on 14/11/1917 from The Prefecture of Bucharest Police, Ilfov District 13, 30 bani revenue stamp overprinted with M.V.i.R. in the vertical double-bordered box, perceived under Art. B§d from "The announcement", published in "The war edition" No. 165 from Bukarester Tagblatt nr. 148/May 31 1917 for passports and identity documents and 10 + 10 bani help stamp overprinted M.V.i.R. in small box, Art 23§d from Special Law 1915 and Help tax stamp doubled According to the Ordinance number 36 from March 30, 1917, published in the "Journal of Ordinance" No. 5 of April 10, 1917. 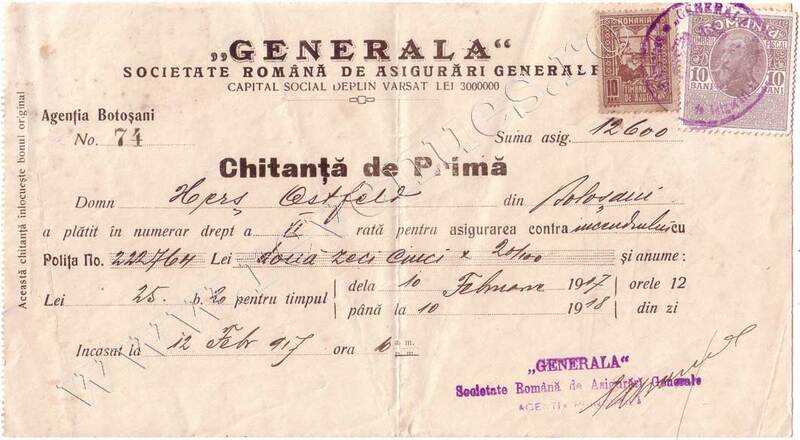 Fig-5 Romanian military identity card for demobilized released on 06/06/1918 The Prefecture of Bucharest Police Ilfov District 13, 30 bani revenue stamp overprinted with M.V.i.R. in the vertical double-bordered box, perceived under Art. B§d from The announcement, published in "The war edition" No. 165 from Bukarester Tagblatt nr. 148/May 31 1917 for passports and identity documents and 10 + 10 bani help stamp overprinted M.V.i.R. monogram, Art 23§d from Special Law 1915 and Help tax stamp doubled According to the Ordinance number 36 from March 30, 1917, published in the "Journal of Ordinance" No. 5 of April 10, 1917. 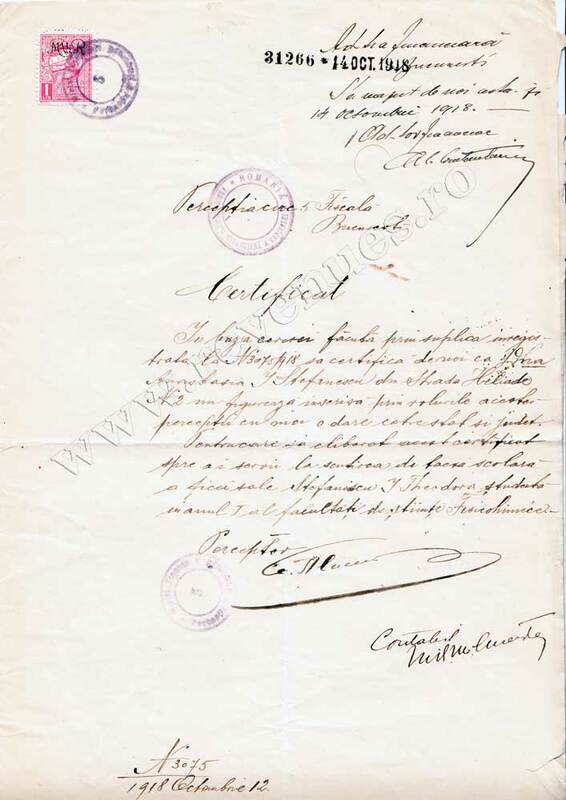 Fig-6 Certificate for school fees exemption issued to 14/10/1918 the Bucharest Fiscal Administration Ilfov district 13, exempt from tax charges under Art. 43§13 for ... certificates to prove transcripts released from the electoral census and any copies of any public documents, certified by any authority. 1 leu help stamp with overprint M.V.i.R calligraphic applied according to the new provisions of from The announcement, published in "The war edition" No. 165 from Bukarester Tagblatt nr. 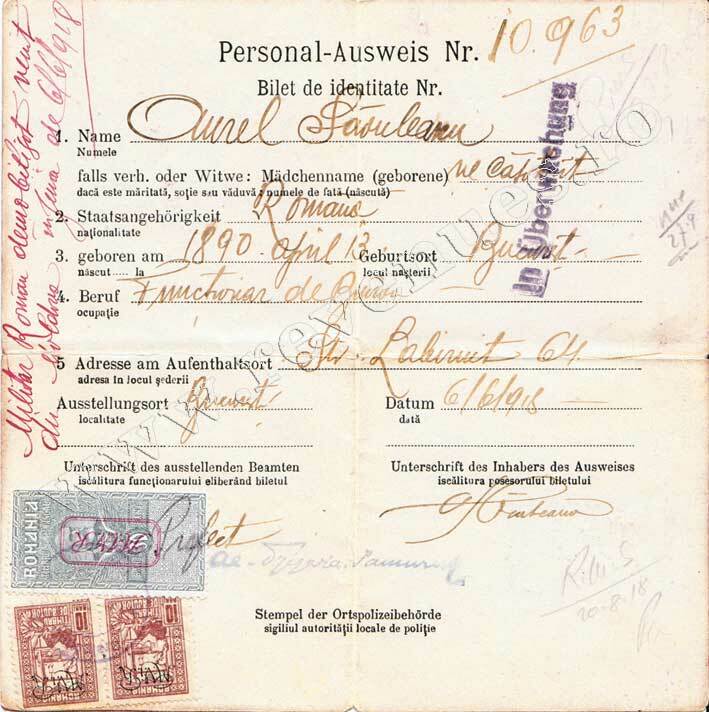 148/May 31 1917 for applications occupation authorities are subject to a stamp duty of 1 leu and According to the Ordinance number 36 from March 30, 1917, published in the "Journal of Ordinance" No. 5 of April 10, 1917 Help stamps can be replaced and used for the same purpose as the existing revenue stamps. 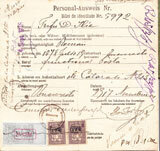 Fig-7 A fiscal paradox a Duplicate contract of sale issued in Bucharest 6-19/1/1919, 1st class, fixed tax stamp percieved with 10 bani revenue stamp M.V.i.R. overprinted (long after Removing from the circulation) under Art. 16§3 from Law on stamp duty and registration 1914 for .... accounts, dockets and invoices, either originals or copies ... and help stamp of 10 bani 1918 issue under Art. 23d from Special Law 1915. 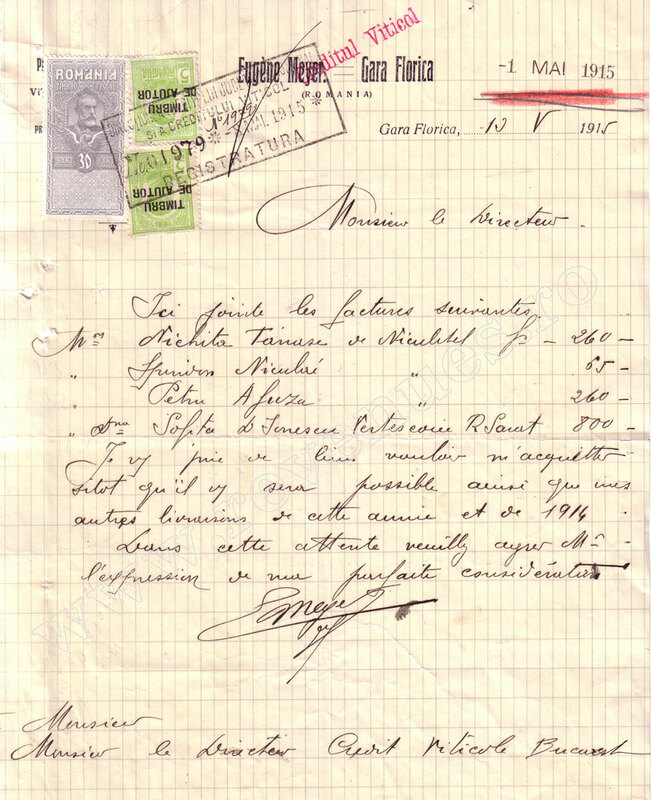 Fig-8 Receipt of cash prizes issued to Botoşani (Romania free country) 12/2/1917, 1st class fixed tax stamp perceieved with a 10 bani revenue stamp under Art. 16§1c, from Law on stamp duty and registration 1914 for each tab in, checkbooks, money or receipts,.. and help stamp of 10 bani 1916 issue under Art. 23d from Special Law 1915. 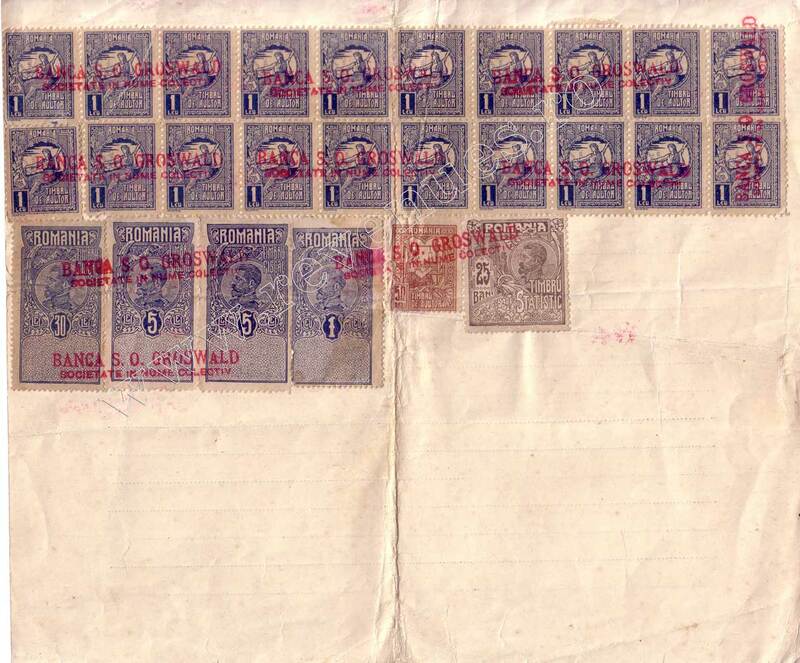 Fig-9 Bordereau for shares sale for a total value of 41.111 lei and 50 bani, of which Lei 61.50 stamps issued in Iasi 26.05.1921, 10th class proportionally tax stamp of 1leu to houndred perceived with Ferdinand revenue stamps 1920 issue, of 30 + 5 + 5 + 1 leu under Art. 29§1 from Law on stamp duty and registration 1920 for all shares or bonds, limited partnerships, or limited liability, and 20 x 1 leu + 50 bani help stamps 1918issue under Art. F§1 a proportionate fee is payable of 50 bani per thousand lei, or part of it, on the bordereau on the sales and purchases of effects except fixed tax of 50 bani provided above, after Implementing Regulation dispositions art 39§c of the Decree-Law No. 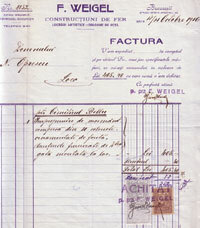 2.538 of 1920 modified, for organizing of the Ministry of Labour and Social Welfare, Art.l. Social stamp taxes established by Art. 39§c of the Decree-Law No. 2.538 of 1920 modifying, in relation to social assistance stamp duty for the organization of the Labour and Social Welfare instead of help stamp of the House support "Family of Fighters". 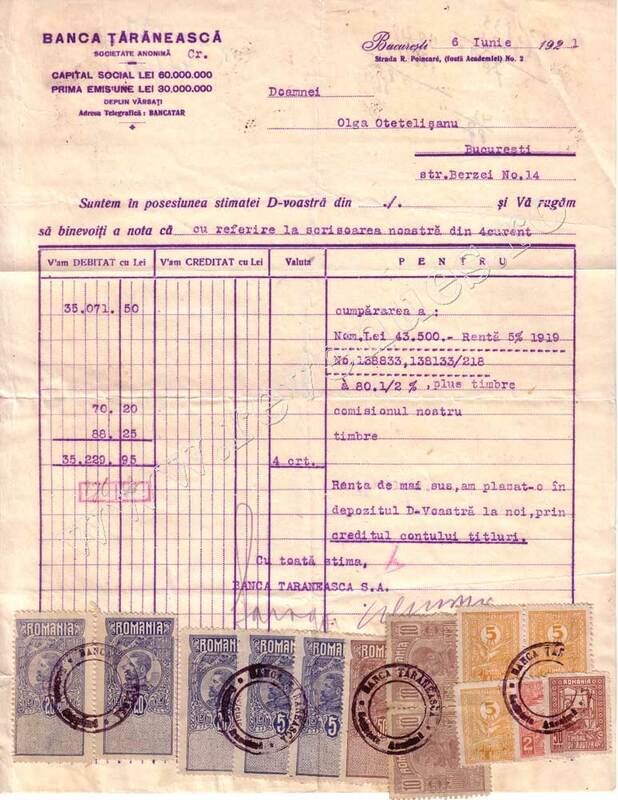 Fig-10 Bordereau buying shares for a total value of 35.229 lei and 95 bani, of wich Lei 88,25stamps, issued to Bucharest 6/6/1921, 6th class proportionally tax stamp of 20 bani to hundred lei, perceived with Ferdinand revenue stamps 1920 issue, of 3 x 20 + 5 + 5 lei + 50 bani + 2 x 10 bani under Art. V (new encore)§2 from Law on stamp duty and registration 1920 sales of shares of civil and commercial and in general any securities varying the dividends, and 3 x 5 lei + 2 lei + 50 bani help stamps 1918 issue under Art. F§1 a proportionate fee is payable of 50 bani per thousand lei, or part of it, on the bordereau on the sales and purchases of effects except fixed tax of 50 bani provided above, after Implementing Regulation dispositions art 39§c of the Decree-Law No. 2.538 of 1920 modified. 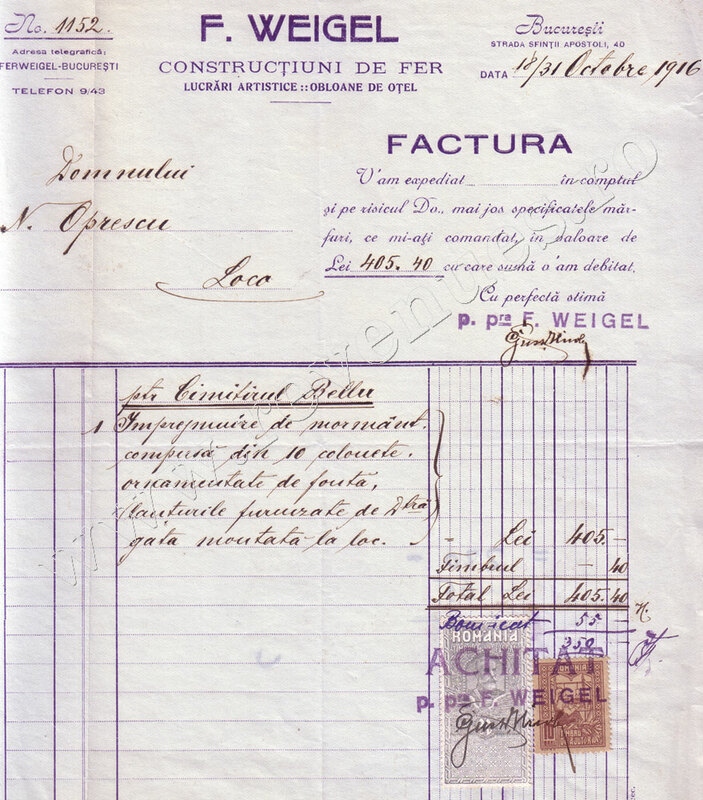 Fig-11 Bordereau for shares sale for a total value of 117.906 lei and 25 bani, of wich Lei 71,25 stamps, issued by official exchange agent in Bucharest 24/11/1920, 10th class proportionally tax stamp of 1leu to houndred perceived with Chamber of Commerce and Industry revenue stamps 1900 and 1911 issues, of 2 x 5 + 1 leu + 50 bani + 25 bani according to Regulation stock of commerce 1913 chapter 1 Art 146, and 11 x 5 lei + 2 lei + 1 leu + 5 x 10 bani help stamps 1918 issue, under Art. F§1 a proportionate fee is payable of 50 bani per thousand lei, or part of it, on the bordereau on the sales and purchases of effects except fixed tax of 50 bani provided above, after Implementing Regulation dispositions art 39§c of the Decree-Law No. 2.538 of 1920 modified. 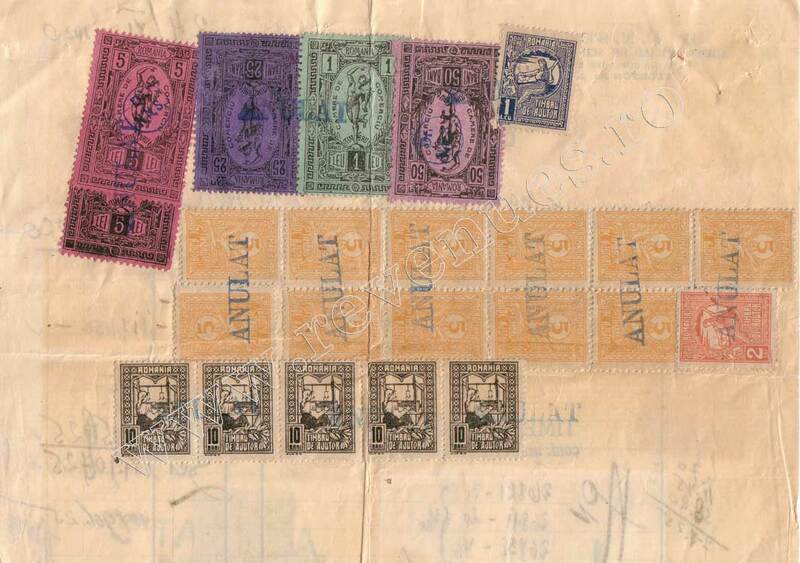 12- Revenue stamps used in Romanian postal service 1872-1915-Călin Marinescu and Ştefan Vârtaci (in Romanian). NOTE Figure 4, 5, 6, 7 are currently in another private collection.